His coaches needed to jet out of town. A bye week for college football coaches means a week of recruiting work, so most of the assistants would leave Madison sometime Wednesday afternoon. That doesn’t make Watt’s day super easy, though. Sort of like when a substitute teacher is filling in, there’s still plenty of work to do. From that 5 a.m. reggae wake up call from Gyptian on his iPhone, Watt’s day is segmented, scheduled and set out in front of him, one thing after the next. He’s a student, but also an athlete, managing a daily workload much like how other 20-year-old students would. There’s class and extracurriculars, meals and roommates; things that shouldn’t make him or any other athlete stick out on campus, veiling them among the club presidents or daily volunteers or student newspaper writers. Obviously the life is different. Just how different, though — in both good ways and bad — is generally left unknown or assumed. Time commitment always leads the discussion. It’s why some student-athletes quit playing the sport they love. It’s why the offseason is easier, both academically and socially, compared to the competitive season. It’s why most students, not even athletes, struggle to match the academic marks they made in high school. A day always has 24 hours, and sometimes it seems like less. The word student-athlete is ordered as such to remind others that every athlete at the university is also a student, though in some cases, the label could very well look more like student-ATHLETE or STUDENT-athlete. Nonetheless, the tag is always there. It can be visually blatant, too. It’s not very difficult to find a guy on campus with an Oakley backpack, emblazoned with a Rose Bowl decal, decked head-to-toe in Wisconsin Adidas apparel, wearing sweatshirt, sweatpants, flip-flops and maybe a pair of shorts beneath the sweatpants. It wouldn’t be out of the ordinary to see them riding a moped as well. The student-athlete label pretty much follows them everywhere. Watt is the starting fullback and also the younger brother of a well-known former Badger, so maybe his prominence precedes him in some cases. However, in class with Hugs Etienne, a less prominent redshirt freshman cornerback, each of them is referenced as athletes and asked about their competition and coaches. To be fair, the one credit class promotes discussion, so the backgrounds of all 12 students have become familiar throughout the last eight weeks. But many times when Etienne and Watt are questioned, it involves a reference to football. That might just be part of the gig when you catch touchdowns on Saturday in front of 80,000 fans, of which 13,000 or so are students who might be taking some of the same courses. Watt doesn’t mind being constantly referenced as a football player or student-athlete. However, when he’s stigmatized because of the brand, he’s naturally a little irritated. At times students will speak their mind on the football team, and, at times, it’s not a glowing review. “People don’t think we exist on campus,” Watt said of the assumption that football players worry about football and nothing else at Wisconsin. 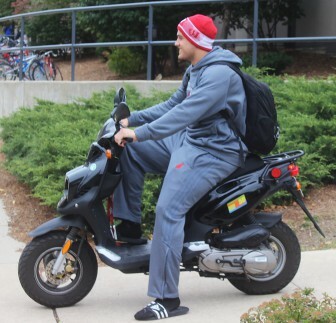 Some people assume athletes get their mopeds for free. They’ll say they don’t see athletes around much, but on a large campus, with a 40,000-plus student body, this should probably be understood. It translates into the classroom as well. During Wednesday’s Qdoba lunch — one of the few hour-long breaks in his day — Watt discussed academics with redshirt freshman safety Nate Hammon, one of his roommates. Watt’s four classes amount to 13 credits. He plans to graduate in four-and-a-half years. By all means, he’s operating the standard academic schedule at Wisconsin. However, the thing that annoys both he and Hammon the most is when people ask them if they attend class. Aside from a personal desire to excel in their coursework — which, to be clear, isn’t a given with all student-athletes — the UW Athletic Department has checks in place to help insure their education. Class-checkers keep track of student-athlete attendance. Professors and/or teaching assistants fill out progress reports. Then academic advisers in the department meet regularly with the players, tracking progress reports and their pace for graduation, asking about how each class is going and how they are handling assignments. Watt fashioned his favorite shake late in the morning — the ingredients supplied complimentary in the football weight room — before a meeting with his adviser. His monthly meetings with her have produced a friendly relationship, almost in a motherly way as Watt’s adviser aids him toward graduation. Depending on how the specific student-athlete displays a management of their workload, these meetings could be once a month like Watt or as much as twice a week. It’s different for each player. 2:30 p.m. is positional meeting time. Watt joins the running backs and fellow fullbacks in a room clad with alumni inspiration from Ron Dayne to Montee Ball. It’s a chummy group of guys, and running backs coach Thomas Hammock fits right in. Jokes and wit bounce off the whiteboard and projector screen. Gordon teases Hammock about his performance years ago in the Toolbox Game of flag-football between Wisconsin and Iowa football managers. Hammock incessantly stated his opinion on the game. It’s a rambunctious start to the meeting. They even forced the fly-on-the-wall reporter in the room to sing a song in front of the group, just like they make every freshman do. It’s their form of inauguration. But it doesn’t take long for Hammock to get down to business. The film session is like a small study group — connective iPads as the essential tools — where each individual is put on display, critiqued, embarrassed, subtly praised and humbled along the way. They’re learning along the way, and need to, because the intricacies of the playbook are astounding. Each play is like a small sentence. Hammock rattles off an irrational combination of names, letters, numbers, food types, directions, etc. Hidden within is a duty and spot for each back, wide receiver, blocker or tight end. Put together, it’s a foreign language; one in which the Badgers are deftly fluent, largely because they have to be. It’s a big deal to Hammock, an appropriate nitpicker in his shrewd attention to detail. Watching film of the morning practice, Hammock sees room for improvement everywhere in the Badgers’ backfield, likely the team’s biggest asset. Gordon could have made his break another yard downfield. Freshman running back Corey Clement carried the ball in his right hand instead of his left; the minuscule things that come together whenever a Wisconsin runner breaks a 60-yard touchdown. Similar to the motherly adviser relationship, the coach-player relationship is somewhat fatherly. Hammock’s criticism has the right intention. He’s hardest on Gordon because he realizes just how good the redshirt sophomore could be. He leans on Senior running back James White for veteran insight — sort of like the eldest brother in a family. An hour after the start of the session, he sends the backs off to their team workout with fatherly advice for handling their bye weekend among the Halloween festivities, while he joins the coaches on the recruiting trail. That workout wasn’t as serious or typical on Wednesday, though most days it’s an understandably important feature of the student-athlete life. Each player on the team must workout twice a week, once by Tuesday and once by Thursday. Given the varying schedules of the 100-plus players on the team, most workouts are done individually, on their own time. Furthermore, they have to maintain a specific weight throughout the season. For skilled players like redshirt senior wide reciever Jared Abbrederis, there is a bubble of two pounds on either side of the designated weight. For “big skilled” players like Watt, it’s three pounds. For bigger players like lineman, there is a four-pound boundary. Weighing in each week, the consequences of weighing in outside that bubble span undesirable things from cleaning weight room windows to an extra, early morning workout. For Watt, it’s not a difficult task to maintain the designated weight, but it’s something that can’t be forgotten. There’s food supplied after the workout, referenced as “Training Table,” which a few of the players liken to hot lunch from their pre-university days. If food isn’t supplied at a mandatory team event, each student-athlete is given a voucher they can use to purchase a meal at various Madison restaurants. And 12 hours after the day began, it is still far from over following dinner. Watt joins three of his teammates that are also in that marketing class at 6:30 p.m. for a mandatory tutoring session at Camp Randall. Having taken a marketing exam the night before, the tutoring session is rendered less important and cut short, opening a much-needed half hour in Watt’s evening, soon to be dedicated to homework and planning a project for that one-credit class with Etienne. 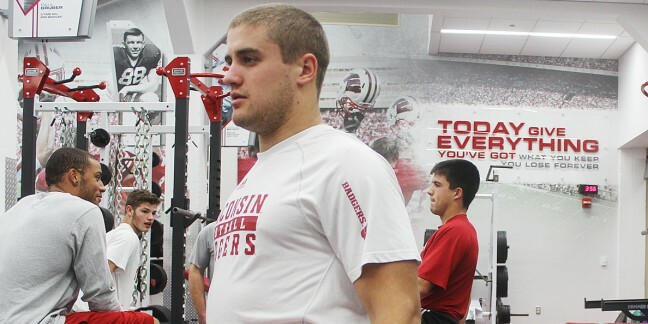 It brings his student-athlete day full circle, the athlete tag starting and ending him at Camp Randall while the student tag started and ended him working on that class. Watt’s Wednesday amounted to roughly four hours of football and four-and-a-half for classes or class-related activities; and that’s his least busy day. Moped rides and On Demand episodes of “Homeland” are sprinkled in the transition. It’s clearly a full day for any student-athlete on the UW football team, surely similar to the full days of other student-athletes on campus. Is it a fuller day than the thousands of others spread out between picnic point and the Kohl Center, Camp Randall and the capital building? It depends, but it’s probably one of the benchmarks for busyness. What cannot be forgotten in the days that start before the sun rises is while it seems like a business schedule formatted for a professional with years of experience, many things remind everyone that these student-athletes are very much like student-non-athletes. There’s everything aforementioned in a typical day, and it’s different than most, but there’s also down time — albeit not much — where high-stakes games of NHL 2012 and maybe an episode of “Maury” are sequenced on the TV. There’s bickering about who’s hogging the chewy, crispy, apple treat and trips to Ragstock for a Halloween costume. 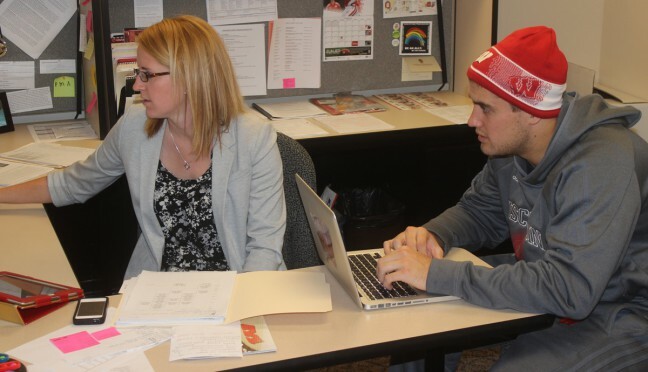 There’s just a different, sometimes wildly demanding life enveloped in it all, but in order to remain as a Wisconsin student-athlete, the busy life is just part of the gig that student-athletes must work around.